Open plan living kitchen diner. Fully fitted kitchen with modern appliances including dishwasher, washing machine, microwave, gas hob, electric fan assisted oven and fridge/freezer. Double bedroom with romantic beamed ceiling. Bedroom 2 with twin beds and additional fold up bed if required. Both rooms overlook the pool and terrace. Shower room with large walk in shower and wash basin. Separate WC with hand basin. Stone built in 1685, situated in the village of Vaunac, the farmhouse and its Gite have been carefully restored keeping their original character. Newly built, the Chalet offers modern and comfortable accommodation. The properties each have a private pool, private gardens, and car parking space. The small hamlet is surrounded by forest and this is where you are likely to see deer or wild boar as they tend to emerge from the woodland very early in the morning or in the evening twilight. Chickens and geese in the garden area are all securely contained in their respective enclosures, and prove to be of great interest to younger guests. Situated only 10 minutes from the market town of Thiviers, these well furnished and equipped holiday homes provide comfortable accommodation for families, as well as couples. The location is ideal for discovering the delights of the Périgord region, and exploring the nearby towns and villages, such as Limoges, Périgueux, Brantôme, Saint-Jean-de-Côle and the martyr village of Oradour-sur-Glane, all within an hour’s drive. This charming cottage has been beautifully restored to a high standard by the present owner, who lives in the adjoining farmhouse. Sleeping up to five in two bedrooms, a cot and high chair are also available for baby if required. The main bedroom has romantic wooden beams and a double bed, and the second bedroom has three full size single beds. Both rooms overlook the pool and garden. The cottage has a walk-in shower room with wash hand basin and a separate toilet off the hallway. Air conditioning is available for the kitchen dining and lounge areas and the kitchen is fully equipped with a gas/electric cooker, microwave, dishwasher, washing machine and fridge/freezer, whilst the lounge and dining area provides comfortable and soft armchairs, a wood burning stove, English satellite TV, dvd player and free Wifi - all for your holiday relaxation. The gardens, sun terrace and swimming pool can be accessed directly from the lounge and the pool area is private and not overlooked. A range of garden furniture and sun loungers along with a BBQ are also available for your holiday enjoyment. This modern timber built chalet has been fitted and furnished to a high standard by the present owner who lives in the original farmhouse nearby. Sleeping up to four in two bedrooms (a double bedroom and a twin bedroom), a cot and high chair are also available for baby if required. Both bedrooms are situated at the rear of the house away from the pool and adjacent to the shower room with wash basin and wc. Air conditioning is available for the kitchen, dining and lounge areas and the kitchen is fully equipped with a gas cooker, microwave, dishwasher, washing machine and fridge/freezer, whilst the lounge and dining area provides comfortable armchairs and a sofa, English satellite TV, a dvd player and free Wifi. The chalet has its own private pool surrounded by a large decked terrace ideal for alfresco dining. A range of garden furniture and sun loungers along with a BBQ are available for your holiday enjoyment. Steps lead from the sun deck to a small children's play area, clothes line and additional outdoor space. Having moved here in 1990 with my 3 small children, I have enjoyed the french way of life in a very tranquil setting but with all the amenieties close by. I fell in love with this property in 1990 because of the ideal location, on the edge of a quiet rural hamlet yet 5 mins drive from the market town of Thiviers with all amenieties and a lovely old traditional market on a Saturday morning where all the locals gather. One of the benefits of this property is that you can walk out of the door, across the garden and the meadow and follow the woodland paths where you can sometimes see the deer and wild boar. There are so many marked pathways which is ideal for walkers and strollers alike. private parking available for all holidaymakers. Log burning stove with glass door, lovely to see the flame on a cold winter's evening. Welcome pack on arrival plus condiments. Fitted kitchen with plenty of worksurface space, U shaped. Notes on accommodation: Gite is heated by wood burning stove, air source heat pump/air conditioning and electric radiators (bedroom and bathroom). Suitable for children. The Chalet is heated by air source heat pump/air conditioning. Towels and bed linen are provided together with a generous welcome pack of food and supplies of washing powders, soap etc. Each property is set in its own private gardens with private swimming pools (approx 6.5m x 4.5m) sun loungers, BBQ and children’s play area. In the surrounding fields and woodland wildlife such as wild boar, deer, foxes and badgers can often be seen. The small quiet hamlet is situated between Perigueux and Thiviers, both towns have all the amenities required. Fresh bread and croissants delivered twice weekly into the hamlet. Restaurant and bar within walking distance. Within the area many Chateaux and caves are open to the public for visits; leisure activities can include canoeing, climbing, walking,golfing, fishing, horse riding, and cycling. The owner Cath Hall left a lovely welcome pack in our gite. The gite was lovely and catered to all our needs . The pool was a good size . I loved that we could take our two Labradors and that they have plenty of garden/ fields to run around in. Cath was very helpful and I would certainly recommend her. 5 stars plus. A wonderful holiday, every attention to detail made. Marvelous host, thank you Cath! you couldn't ask for much more , I would give this place 5 stars, the swimming pool the cottage the owner all get my 100 percent, there is nothing more one could ask for to be added to this beautiful place I take my hat off to the owner cath, magnificent job. would I stay again most definitely. Thank you Martin for a lovely review. Look forward to seeing you again. 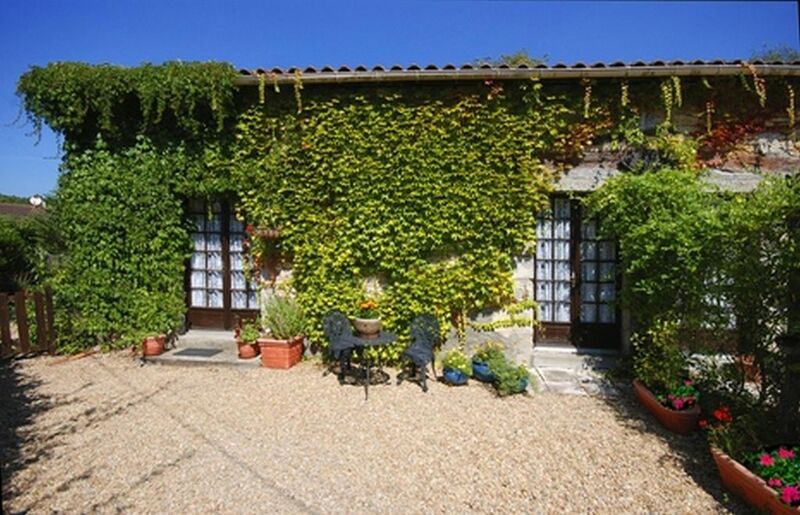 Lovely gite friendly and welcoming owner...perfect. Had a lovely stay in Vaunac..went to Brantome, Perigueux and L'isle. The gite had everything supplied and one of the best we have stayed in. Highly recommended. We arrived at the property to a lovely friendly welcome together with food items - bread, cheese, pate, milk, croissants, jam and a bottle of wine. Lots of basic cupboard ingredients too. The property was clean and well-equipped and outside was the courtyard leading on to an inviting pool area with table / chairs and sunbeds, BBQ and gardens. There were geese and chickens (who enjoyed being fed left-overs) and a large open area where we played badminton. I cannot thank the owner Cath enough for her help and advice during her stay, especially when we had problems with our van and needed it looked at before the journey home! The town of Brantome nearby was great to visit and we hired canoes (or you could try paddle boards). The Friday market there was well worth a visit. I wouldn't hesitate to recommend the property to friends / family. Limoges airport is 70 kms, 1 hr drive. Bergerac airport is 80 kms, 1.hr 15 drive. The local region, ‘Perigord Vert’ is a superb part of the Dordogne for sightseeing, and for the more energetic there is, walking, cycling, golf, horse riding, fishing, tennis, rock climbing and water sports. The region abounds in Chateaux, caves, historical monuments and museums, for all of which brochures etc are available from the tourist offices in Thiviers 10 mins drive and Perigueux 30 mins drive. All essentials are available in Thiviers 10 mins drive and Negrondes 5 mins drive, bakers, butchers, newsagents, grocers and restaurants. On the outskirts of Perigueux there are Hypermarkets and shopping precincts. Then there is Perigueux itself, with its large stores and boutiques and not forgetting the delightful old town. There are open-air markets in Perigueux, Thiviers, Excideuil 20 mins drive and Brantome 20 mins drive. We can advise you on which days the markets operate. Just a short walk away, there is a traditional French restaurant, serving local cuisine. Booking Notes: 25% non-refundable deposit to be paid so that booking can be confirmed. Full balance and refundable security deposit to be paid 8 weeks before rental period. Changeover Day: Lettings are from Saturday 5pm to Saturday 10am. Notes on prices: B&B available on request- please contact the owner starting from £50 per room, per night, out of high season. Private use of the gîte.